TVXQ! 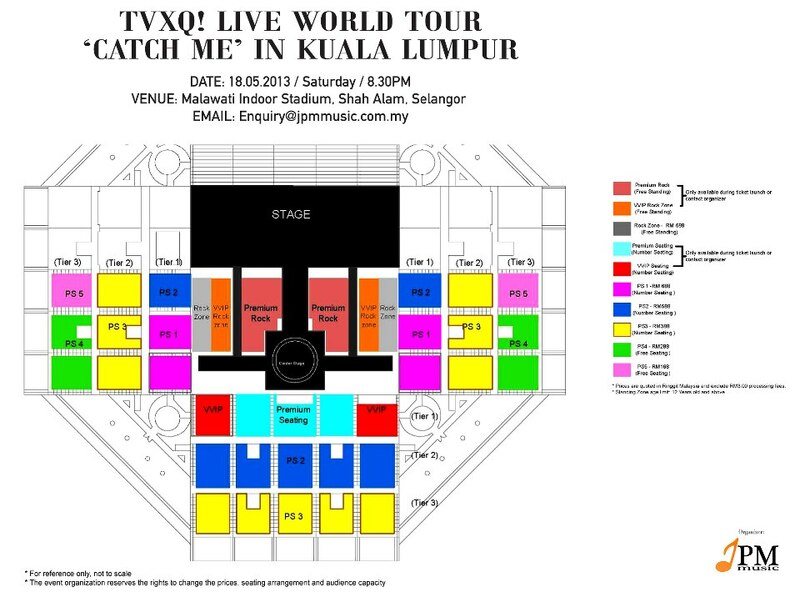 Live World Tour ‘Catch Me’ In Kuala Lumpur- Official Layout. Ticket Launch on 16th March 2013, 11am, at Sungei Wang KL, all tickets are available at Ticket Launch.Online tickets start from 2pm, 16th March 2013. *For those who are interested to buy the premium rock zone (RM888)and VVIP rock zone(RM788), please pre book from us at booking@jpmmusic.com.my. These zone are limited and only available at ticket launch . VVIP Seating (RM788) and Premium seating (RM888) are available at ticket launch only. Please refer to JPM Music website www.jpmmusic.com.my for clearer layout picture.